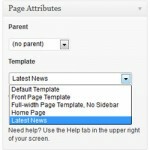 Creating a WordPress latest posts page or news page with excerpts (Starting Snippets of your posts) in WordPress. We will be creating the latest posts page by using a child theme based on the default Twenty Twelve theme, if you have not yet created a child theme then read this first. The first task is create a latest news page template, use the below code and copy it into a plain text editor like note pad or notepad++ which you can download from here. You now upload this to your child theme in /wp-content/themes/ ‘your-child-theme-name’ /page-templates, once you have done this you need to go to create the page itself. 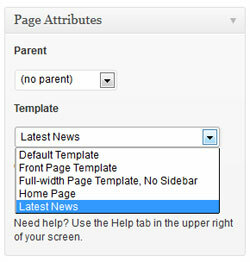 Go to Pages>Add New in your WordPress admin area, create a new page called Latest News or Latest Posts write a small piece about the page in the content area, now on the right hand side you will see under Page Attributes>Template use the drop down and select your new template Latest Posts. That is it you can change the number of posts shown by altering the below number from 3 to what ever you like. Reference material for get_posts also WP_Query. If you want to add a read more link then click here. Hi there, I found your website via Google at the same time as looking for a related topic, your site came up, it seems to be great. News Page with Excerpts | WordPress | Latest Blog Page. Hi Abby, you are right I should have called it latest posts or articles? I might change it.